Photo courtesy of Joel Murray. Found at a buffet in China. Supposed to say “food scraps”. – Waiter! Can I balls? People, it’s what’s for dinner. Manufacturing area for Soylent Green. Watch your back, or you might be the next item on the menu. – Wife or daughter, Sir? So that’s the special at J. Dahmer”s Diner today. – Who’s for lunch, dear? I’ll have the Vegan burger. I’ll be a little late but keep an eye out for me. Do Cannibals refer to homeless people as Free Range? This was supposed to be the backup plan for Mr. Largo when he failed to kill James Bond in the shark pool. I’m here till Friday. Try the veal. Thank you. *Ceaser’s salad (now with 20% more Ceaser). The next sign along says “Here there be dragons”. They also serve vegetarians… When they can get them. Cannibalism is a detestable practice but sometimes de testibles are de best part. Please eat your meals omnivorously. Oh, the humanity!… For your dining pleasure tonight! Taste and meat our family! If I eat Vegans, can I get the benefits of being a vegetarian, as well as the benefits of being a meat-eater. Would the Omega Men count as being Vegan-friendly? Our restaurant eat-all-you-want. Eat your Phil! Hi, I’m your server, Happy Chu. Tonight we’re serving Dim Sum. Dim is fresh from Shanghai, and Sum is newly arrived from the provinces. A buffet in China, or the “Alferd G. Packer Memorial Grill” at the University of Colorado at Boulder? I never tasted a cannibal I didn’t like. 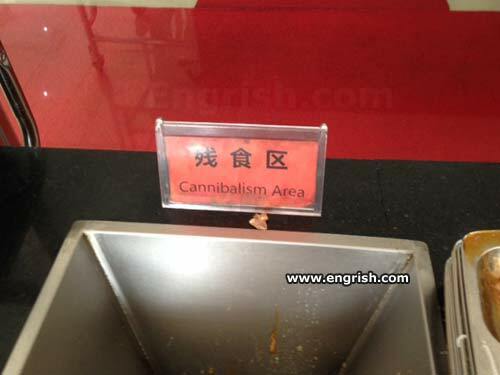 Good old Google Translate is still translating “cánshí” into “cannibalism”. We know where they’re getting that sign from now. This will be a common sight when zombies roam the earth.